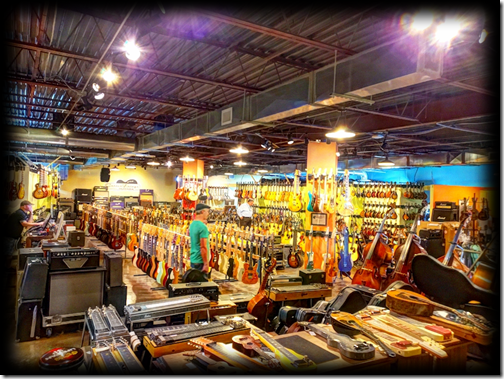 Having said all of that, Harold and I spent a great afternoon visiting two stores, and here’s the lowdown on them. 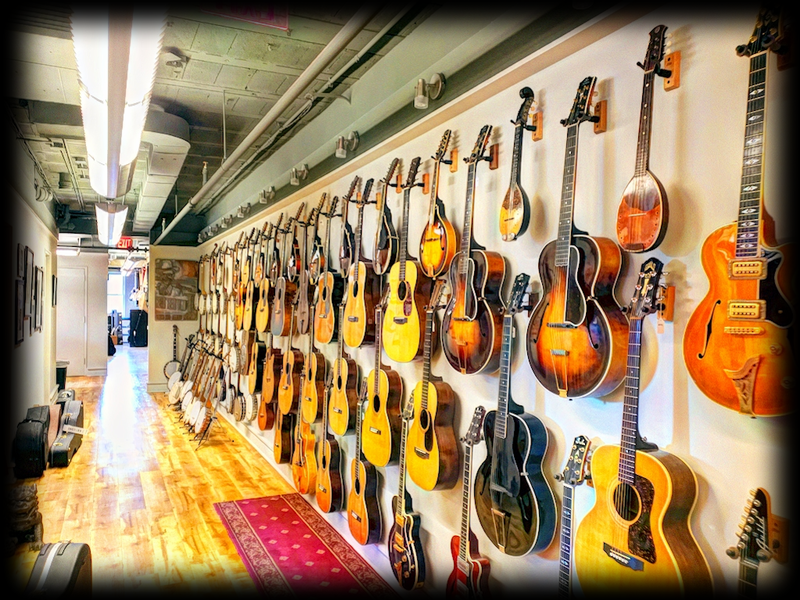 I found a pristine 1918 Gibson Harp guitar on the second floor that would have found a nice home in my studio, but once again – the $7,500 price tag was more than I could muster. 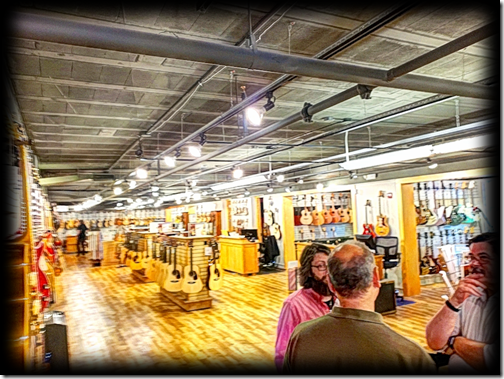 As Harold and I were perusing the various vintage guitars on the second floor, we bumped into George Gruhn, the founder and owner of Gruhn Guitars. George is something of a legend in the Music City, and he’s also the nicest guy you could ever meet. George invited Harold and me into his office to see his amazing collection of – pythons. Yes, you read that correctly – George has a dozen or so pythons and other snakes in his office. The three of us talked about his collection of reptiles, and then George brought out a couple of his snakes for us to hold. Harold held a tiny but friendly pale-colored python, whereas I held a species of serpent that resembled a coral snake a little too close for comfort. He was a full-sized and quite curious fellow; he kept trying to inspect what I had in my pockets, and I had to keep shifting him from arm to arm in order to prevent him from falling. After ten or so minutes of reptilian admiration, we returned the snakes and resumed our discussion of guitars. We all laughed about George’s observation, but George pointed out that many collectors do not seem to actually care about the quality; some of the collectors he meets are simply trying to fill a generic void in their collection. I responded that I buy different guitars for specific purposes; each of mine is unique and purchased for an individual sound or purpose. 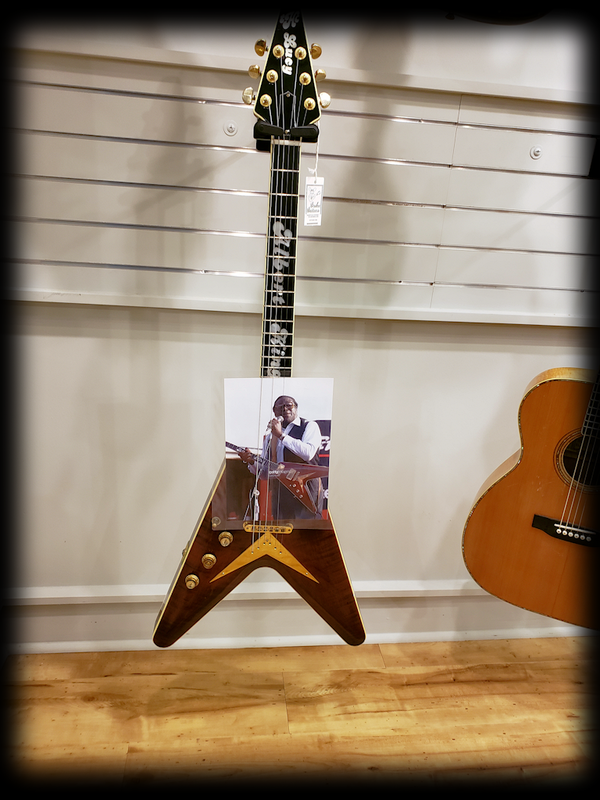 George also produced a Martin that I played briefly, and when I commented that I much preferred the neck on my Taylor for playing fingerstyle, George produced a trio of Taylor prototypes that had not yet been assigned a specific model number. (One of the prototypes was personally signed by Bob Taylor and addressed to George.) I liked the Taylors much better; their necks were more like what I was accustomed to playing. 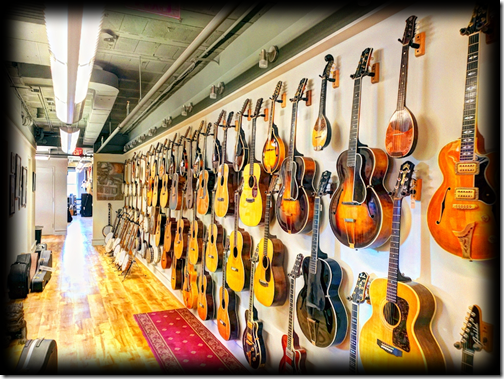 After a few minutes George needed to head back to work, so Harold and I headed downstairs, where Harold continued to put the resonator from George’s office through its paces while I browsed through the wide-ranging collection of acoustic guitars. About ten minutes later George found me; he said that he had a 1946 Epiphone upstairs that he wanted to show me, so the two of us headed back upstairs to check it out. I own an 1965 Epiphone 12-string, and George’s 1946 6-string was somewhat reminiscent of my guitar, (albeit in better shape than mine). I swapped out the Epiphone for one of the Taylor protoypes, then George picked up a 5-string banjo and started to play various melody lines in Old Americana, Celtic, and Klezmer/Yiddish styles as I tried to keep up with the rapid chord changes on the guitar. 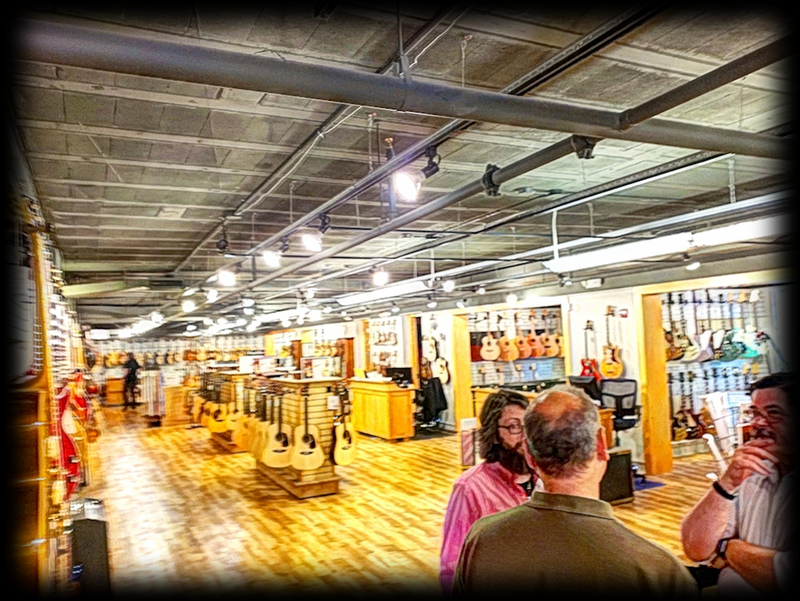 It was a fun, impromptu jam session between guitar geeks, and I had a blast. Eventually Harold joined us on the second floor, and it was time for us to go. I had to meet my wife downtown for a previous engagement, so Harold and I bid George adieu and headed off into the proverbial Tennessee sunset.